Easter weekend saw head to Killorglin to take part in Ras Mumhan, a four day stage race which attracted Teams from England, Scotland and Holland. A total of 35 teams and a field of 209 riders took to the start line. 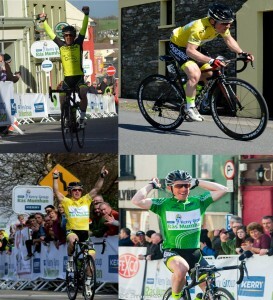 The Team had an amazing weekend with Paidi O Brien winning the first stage and taking the yellow jersey and the lead in the green jersey competition. Things got even better on stage 2 with Paidi picking up the win once again and holding onto the yellow jersey and extending his lead in the green jersey competition. Stage 3 saw Paidi finish 6th and unfortunately lose his lead of the yellow jersey by 42 seconds, but he remained in the lead of the green jersey points competition. Stage 4 saw Paidi pull off his hat trick, taking the win once again and securing the green jersey. the win also saw him move up to 5th overall in the General Classification. The weekend proved to be more fruitful for the Team then anyone would have hoped, and we plan to keep the results coming in with races in Fermoy, Nenagh and Currow in the next few weeks.